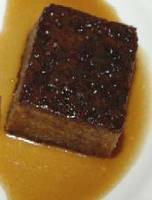 I first tasted a sticky toffee pudding at my friend's (Alec) house in U.K. Ever since, I became a total fan of the recipe. As will you. This recipe belongs to Alec's grandmother (whose soul now rests in peace). Although I have made minor changes to the recipe, but I am honored to dedicate this page to Alec's grandmother. 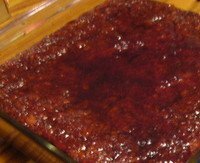 I think the beauty of this pudding is the overall flavor that comes out, when the toffee sauce is combined with the date and walnut pudding. It is amazing. You have to try it out to believe it. Place the chopped dates in a bowl and pour the boiling water on top. Add the bicarbonate of soda and set aside for 25-30 minutes. Beat the butter and sugar until light and fluffy. Add 1 egg at a time and continue to beat until blends well. Also add the vanilla extract. Stir in the flour and mix well. To this add the dates along with the water. Mix well. Transfer this mixture to a 9" x 9" square greased dish. Bake in a pre heated oven at 180° C for 40 minutes. When done, take out and let it cool a bit. Melt the butter in a pan and add the sugar and cream. Stir gently on a low heat for 3-4 minutes (until the sugar blends well). Cut equal squares of the pudding and place on a plate. Pour this lovely toffee sauce on the top. Poke the pudding with a fork and drizzle all the sauce on top.